You read that right: I have moved the site to smartfootball.com -- tell your friends. Don't panic, don't fear, everything is staying just the same except for the new, fancier digs. So check it out, and continue to show up, as there won't be anymore new content here on Blogspot (though all the archives will remain). Over at Dr Saturday. As always, thanks to the Doc for the invite, and check out the full thing here. ... and get off the jam, via Ron Jenkins. All receivers must master -- and I mean master -- at least two of these release moves. At the NFL level, you need three if not more. But all receivers, college and high school, need to be masters of two and competent at three or four. Don't forget to use hands. The best release move in the world is useless if you don't get back on top of the defender. The receiver wants to run his route literally behind and through the DB -- as a result he wants the DB to move his feet, so that the receiver, although making moves, more or less runs in a straight line. If the receiver has to run in or out to get into his route he's losing. If you can stop, you can get open. All receivers must learn to stop immediately while in full speed. If you can stop in two short steps, you can always be open. On deeper routes, it might take three, but stopping -- slamming on the breaks -- is the key to cutting, breaking either direction, and just getting open generally. Ron Jenkins doesn't really discuss it, but one imperative technique is to learn to "lean into" the defense back at the top of the routes. If you're running an out against press man, once you hit about 10-12 yards you should be "leaning into" the defensive back before you break and separate away. Somewhat counterintuitively, on some of these routes you do want to be near the defender before breaking away at the last minute, and never too early. But this lean will get the defender's center of gravity and momentum going in the wrong direction. Mike Leach is famous for this coaching point. Some routes (and route concepts) call for sharp breaks, others for more rounded but quicker "speed cuts," which aren't quite as precise but the receiver doesn't slow down as much. Know the difference, and always know which is appropriate. I want to address an age-old water cooler question that Chris discussed in his post at Smart Football. Consider two RBs, both with identical YPC averages. One however, is a boom and bust guy, like Barry Sanders, and the other is a steady plodder like Jerome Bettis. Which kind of RB would you rather have on your team? The answer is it depends. Essentially, we have a choice between a high-variance RB and a low-variance RB. When a team is an underdog team, it wants high-variance intermediate outcomes to maximize its chances of winning. And when a team is a favorite, it wants low-variance outcomes. Whether those outcomes occur through play selection, through 4th down doctrine, or through RB style, isn't important. If you're an otherwise below-average team, you'd want the boom and bust style RB. If you're an otherwise above-average team, you'd want the steady plodder. . . .
Further, even if the high-variance RB has a lower average YPC, we'd still want him carrying the ball when we're losing. This is due to the math involved in competing probability distributions. [w]hat amazes me is how similar they all are to each other and to the league average. . . . Usually, a RB needs 4 to 5 yards to just break even in terms of his team's probability of converting a first down. 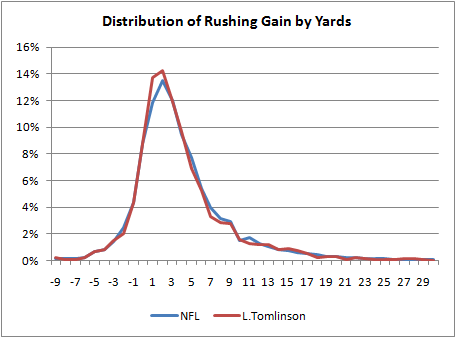 What we'd want to see on a RB's distribution is as much probability mass as possible to the right of 4 yards. Adrian Peterson's 2.2% figure is exceptional. It's interesting because it really suggests that what separates Peterson as a great runner is based on only 2% or so of his runs. Otherwise, he's practically average. 2. Courtesy of Brophy, I have added video of Mike Leach's "settle & noose" drill, which, it will be recalled, is both a great warm-up drill and works on teaching receivers to find holes in the zone and quarterbacks how to deliver the ball to them. "You'll practice on a Wednesday, and you'll come in Thursday morning and he'll have the film up there from practice," Brady says. "Sometimes, during practice, you throw a bad ball—that's the way it goes. But the video comes up and he says, 'Brady, you can't complete a g--damn hitch.' And I'll be sitting there thinking, I'm a [expletive] nine-year veteran, I've won three ---damn Super Bowls — he can kiss my... That's what you're thinking on the inside. But on the outside I'm thinking, You know what? I'm glad he's saying that. I'm glad that's what he's expecting, you know? Because that's what I should be expecting. That's what his style is." 4. Bruce Feldman chats with Norm Chow, who materializes into matter from various spectral rays to participate. 5. The NY Times's The Quad Blog chats with Dan Shanoff about, what else, his Tim Teblow blog. 6. Spencer Hall/Orson Swindle to SB Nation. When you get $7 million from Comcast, you better find ways to spend it, and I can't think of a better way than for SBNation (whose official name is "Sportsblogs, Inc.") to lure Every Day Should Be Saturday's Spencer Hall over, including away from the Sporting News. I like everyone else think this is a wise move for both sides, but one underrated aspect is that Mr. Hall/Swindle (Mr. Hall-Swindle? I kind of like that) will be able to focus on just one blog (and probably a book too), which should really let him flourish. 7. Holly over at Dr Saturday remembers Northwestern's magical 1995 season, which is still the only 10 win season in school history. This was a sort of epoch-changing season for NW -- though that is a very relative statement -- in that the Wildcats' history since has been considerably better. Indeed, two years later I saw them play in the Citrus Bowl against Tennessee (this was back in the "You can't spell Citrus without UT" days). Though, most of that game was spent marveling at the show Peyton Manning put on (408 yards, 4 touchdowns, no interceptions) as I sat there telling everyone around me what Peyton Manning's audibles would be (for some reason Northwestern thought it could play man coverage against Tennessee's receivers, so he kept checking to fades and slants). In any event, it is hard to overstate how strange but wonderful that 1995 season was for Northwestern. In football, sometimes the gods are with you. At the NFL level, where nearly every player has already won the DNA lottery, there are plenty of candidates to be effective tight-ends who can both run block like guards and get downfield like receivers -- or at least there are enough to be a force in the league and make every other team salivate (I'm looking at you Antonio Gates). At the lower levels though, finding one of these perfect specimens isn't so easy. And, with the rise of the spread, it is no surprise that tight-ends don't take the field quite as often as they used to. But reports of the demise of the position are overstated. It takes a sixth frontal player (not counting the QB) to pull an identifiable pass defender into the front and to give the blockers something to work with to keep the center off the island. It takes the sixth, just as it takes him to deal with a blitz. Which is a better sixth [blocker, a tight-end or a runningback]? A TE is more of a threat with the delayed pass that makes the pass defender on him stay at bay while the TE blocks the rusher. I think a TE is the better. Anyway, this is not so black and white, RB versus TE. It's all shades: imagine lining up with a FB in the I. Now the FB cheats over; he lines up in a two-point stance, behind the guard at 4 yards. Now behind the tackle at 3 yards. Now he splits the tackle with his inside leg, at about 2 yards. What is he? A FB or an H-back? He can BOB the linebacker, no? He can still kick out for power, release into the flat, maybe even take a handoff if he comes inside enough. Now he steps over maybe another foot, etc. Now suddenly he's a tight-end/h-back all the way? And all those advantages are lost? Also don't confuse personnel with position. You can put anyone you want there. I don't see why your RB is some invaluable pass blocker, despite the fact that he has to work on carrying the ball, catching the ball, and blocking in the run game, while the TE is just helpless? Nothing wrong in HS in having a division of labor for these positions. On most teams I've been around, the TEs spend more time practicing with the OL than they do the receivers. If you want a glorified slot guy, then sub a receiver in and go from there. Or use a FB type (if you're got one). Bottom line: it's an exceptionally useful thing, and don't be straitjacketed by black and white conceptions. The advantage of the four wide spread was a division of labor thing -- you could put four wides out there and get mismatches against the other team's base personnel, and often get them out of their base looks. You might not have a good TE or fb, so you didn't put one out there; you looked for advantages elsewhere. Nowadays with everyone being spread, is that really the case that just going four wide gives you all these mismatches? I'm not so sure; using a TE -- or alternating between TEs, FBs, and slot receivers -- seems to me the better move. 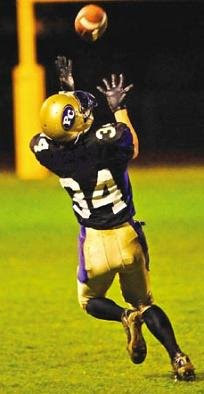 I consider my base offense to be 3 WR, 1 QB, 1 RB, and then a hybrid H-back position. That H-back position can be a true slot receiver (routes and jet sweeps), a FB, a true TE/H-back (either as a blocker or hybrid guy, though those are quite rare), or even just a 2nd RB. Depends on the guys you have, what you're trying to accomplish, and also your depth (can do a lot of great things if you have a couple of kids who fit the above descriptions and then just sub them in and out to give different looks). But unquestionably, TE is maybe my favorite position. True, it's not always easy to find a good one, but it helps a lot. (And the two best formations in football might be trips closed and a TE/wing set, with a TE and a wing player to one side, and either a split end and flanker or a twins look). To me, a RB who starts out deeper in the backfield is in much better position to pick up blitzers, chip DEs, or even take a DE 1-on-1. . . . Now, compare that to a TE, who is always on the end of the line and is really only in position to pick up somebody coming off the edge. He also has far less time and room for error in diagnosing a blitz or stunt and getting his body where he needs to be. I disagree; it is best not to overthink this. One, if you're having that many problems you can always back the TE up to be an H-back so he can see more. 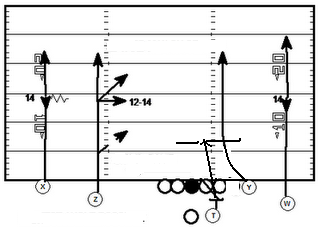 Second, you can make a very simple call ("solid") if the DE lines up on or outside the TE and the LB lines up inside. If both the DE and LB come (and don't twist) the tackle takes the LB and the TE takes the DE; if the LB doesn't rush then the TE passes the DE off to the tackle before releasing. You do get into the matchup issues, but it's not so ridiculous like he can't get there or will just whiff. It's just a simple area principle. Check out the highlights of the 1980 Sugar Bowl (between Bryant's Crimson Tide and Lou Holtz's Arkansas Razorbacks) for some great wishbone stuff, but, as reader Ben Smith points out, they show a decidedly "flexbone" look at the 3:16 mark. Feagin told investigators that “when I first started going to (Burke’s) house he had three big jars of weed up in his room. … One day T.J. was talking to me about some illegal stuff. He was under a lot of pressure because of his financial problems. Feagin arranged to send $600 to a friend in Florida, whom he identified only as “Tragic.” In exchange, “Tragic” would send an ounce of cocaine to Ann Arbor. It goes on from there. No cocaine ever showed up, this Burke guy tried to scare/murder Feagin by filling a bottle with gasoline and setting it on fire outside his dorm room, etc, etc, etc. You know, typical college stuff. . . . TJ Burke does what he wants, which is apparently spend up to ten years in prison. Feagin was a last-minute addition to Michigan's first class under Rodriguez when it became clear that Rodriguez wasn't likely to acquire a higher-rated quarterback recruit. He did not work out, obviously. The Freep article dryly notes that Feagin "struggled to learn the playbook" mere paragraphs after describing Feagin's extensive marijuana habit. . . . But seriously: it's bad. It's also one guy that Michigan apparently didn't run as thorough of a background check on—or possibly any background check on—as they scrambled to reconfigure Rodriguez's first recruiting class. As long as the incident remains isolated, fine. . . .
2. Mark Sanchez might win the Jets' job, but is he crossing over from confident to arrogant? 3. The NY Times Fifth Down Blog remembers Eagles defensive coordinator Jim Johnson (and includes your humble blogger in its roundup). 4. The pro-football reference blog with Part III of its quest to rank the greatest QBs of all time. 6. Saurian Sagacity looks at statistical characteristics of BCS champions. This is good and fine, but as Dr Saturday pointed out, the BCS winner hasn't always been the "best" team over time, or even in a given year. This is not a BCS knock -- and on this score I don't think a playoff would reduce the randomness of who gets crowned champion -- but it's worth remembering. 6. The end of the postal service? 7. Callers, tossers, and the odds of the flip. 8. History of the Times New Roman typeface. [o]f the five starters Leach has trotted out in nine years, every one has topped 4,000 yards and 30 touchdowns in a season; even in terms of efficiency as opposed to straight cumulative totals, they've been remarkably consistent from year to year. He also notes that it's unlikely that Texas Tech will quite reach the heights they did last year, and that "[u]nless the stars align for the new kids in some unforeseen, improbably way, even 4,200 yards and 35 touchdowns could feel like the first hints of stagnation in the success story." Quite likely. But how has Leach continued to produce such wildly successful (in terms of stats, at least) quarterback? One answer is "the system," but let's get more specific. The Captain has frequently noted that his system is all stuff that's been done before. Indeed, what is remarkable is that guys can seem to leap off the bench and do nothing but throw completions. He had one of the great three-year runs, where, defying the common spread/passing offense wisdom of playing your younger guy so they can get some experience, he rode three fifth-year senior quarterbacks to great heights (and, again, stats). Last year, Tech averaged 60 passes a game so it is obviously not a balanced attack, but this actually works in their favor. In practice, they spend virtually all their time focusing on fundamentals related to the passing game. From the time they hit the practice field until they leave, the ball is in the air and the emphasis in on throwing, catching and protecting the quarterback. It takes great confidence in your scheme to be able to take this approach, but the players appreciate it because they can focus on execution. When you watch Texas Tech practice, it doesn't seem as structured as most college practices. They do not stretch as a team and unlike most practices, there is not a horn blowing every five minutes to change drills. The bottom line is that the cosmetic appearance of practice is not as important to Leach as it is to some coaches. Although not as structured, it is impressive to watch Texas Tech practice and you quickly see why it is so successful. The ball is always in the air and what the Red Raiders practice is what you see them do in a game. They work on every phase of their package every day and in most passing drills, there are four quarterbacks throwing and every eligible receiver catching on each snap. There is great detail given to fundamentals in all phases of the passing game. Wide receivers, for example, work every day on releases versus different coverages, ball security, scrambling drills, blocking and routes versus specific coverages. Pat-n-go: This is another simple drill. Most teams use a form of "route lines," or quarterbacks dropping and receivers running routes on "air" -- i.e. with no defenders. The one clever insight here is that one group of QBs and receivers lines up on opposite from another. This way they can complete a pass, have the receiver burst as if scoring, and simply get in line on the opposite side of the field, rather than have to run back through. Just another way they get more repetitions. 7-on-7 and man-to-man: These are what they sound like, and most do these drills. One-on-one or man-to-man involves the receivers going against press man in practice, while 7-on-7 is like a real scrimmage, minus the linemen. Tech gets an amazing amount of repetitions in practice and most importantly, it doesn't waste reps practicing things they don't do in a game. Indeed, if you're third-string quarterback at Texas Tech, I can't imagine a program whose third-stringer gets more reps than you. Same goes for second-string, third-string, etc. Now, games are certainly different -- Tech's defense has never been confused with Texas's or Oklahoma's -- but these drills, coupled with their total commitment to throwing the ball, is a big factor in Leach's ability to churn out successful quarterbacks.